Just three weekends of regular season action remain in the NFL. Steven O’Rourke has your guide to who needs to do what to make the playoffs. 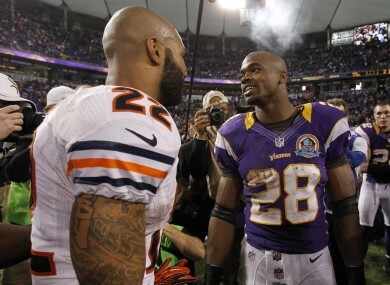 Both Matt Forte (left) and Adrian Peterson could miss out on the playoffs this year. IF YOU WANT an idea of just how good Adrian Peterson has been for the Minnesota Vikings this season then look no further than the fact he averages more yards per rush (6.04) than his quarterback, Christian Ponder, averages per pass attempts (5.99 yards). Indeed, according to the NFL’s own statistics, Peterson has more rushing yards in his last seven games (1,101) than four teams – the Jaguars (1,068), Raiders (1,055), Cowboys (1,038) and Cardinals (1,021) – have all season. And yet, despite how well Peterson has played, the Vikings will probably miss out on the playoffs this season. However, a number of other teams could clinch a postseason berth this weekend and, below, you’ll find out exactly what they need to do it. AFC South – The Houston Texans clinch the division with a win over the Indianapolis Colts this Sunday. They will also secure a first-round bye if the Denver Broncos lose to the Ravens and the New England Patriots tie with or lose to the San Francisco 49ers. The Colts can also secure a playoff spot if they beat the Texans. However, a tie would suffice if either the Steelers or Bengals lose or tie or if the Ravens win. They could still make the postseason with a loss, provided both the Jets and Bengals lost. NFC North – The Green Bay Packers will win the division if they beat the Chicago Bears on Sunday. A tie would not be enough to claim the NFC North but it may be enough to secure a playoff spot for the Packers if a number of other teams including the Dallas Cowboys and Washington Redskins slip up. NFC West – The San Francisco 49ers will win the division if they beat the Patriots on the road and the Seattle Seahawks lose to the Buffalo Bills. A win would also be enough to see the 49ers secure a playoff spot, as would a tie if the Cowboys, Redskins and Vikings all fail to win. NFC South – The Falcons have already secured a playoff spot and the divisional title but will guarantee a first round bye with a win over the Giants and either a loss for either the 49ers or Packers. Email “The Redzone: Crunch time nears for NFL teams”. Feedback on “The Redzone: Crunch time nears for NFL teams”.